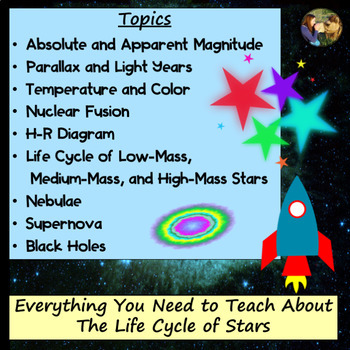 Life Cycle of Stars PowerPoint, Student Notes, and Kahoot! 37 MB|60 Slides, 4 Pages Notes, 3 Pages Answers Key, and Kahoot! 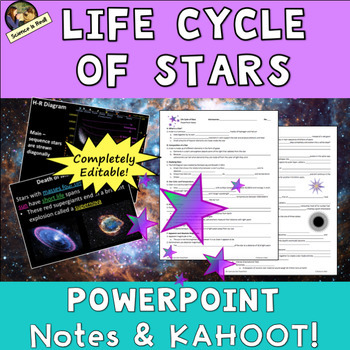 This stellar 60-slide EDITABLE Star Characteristics and Life Cycle of Stars PowerPoint is accompanied by 4-Pages of editable fill-in-the-blank-style notes and a custom KAHOOT! The presentation is embedded with short engaging videos, gifs, amazing graphics, photos, diagrams, and a customized Kahoot! Game for review! As your students move through the slides, they will complete the student notes. Notes are chunked in order by slide and answers to notes are colored and underlined on each slide so students know exactly what to write down. Click on the Preview To Learn More! All New Products are Discounted the First 3 Days of Posting! - Purchase of the product is for single classroom use by the purchaser only. It is a violation for individuals, schools, and districts to redistribute, edit, sell, or post this item on the Internet or to other individuals. Disregarding the copyright is a violation of the Digital Millennium Copyright Act and subject to legal action. 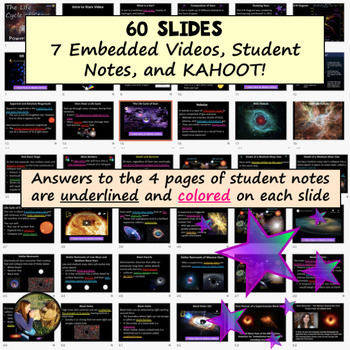 ⭐ The Solar System PowerPoint, Student Notes, and KAHOOT! ⭐ Earth, Moon, & Sun System PowerPoint Bundle! 5 PowerPoint With Notes & Kahoot! ⭐ Moon Phases and Features PowerPoint, Student Notes, and Kahoot! 60 Slides, 4 Pages Notes, 3 Pages Answers Key, and Kahoot!